The Club encourages showing by members with the organisation of various competitions (including the Champion of Champions) and the award of special Championship rosettes at many shows. 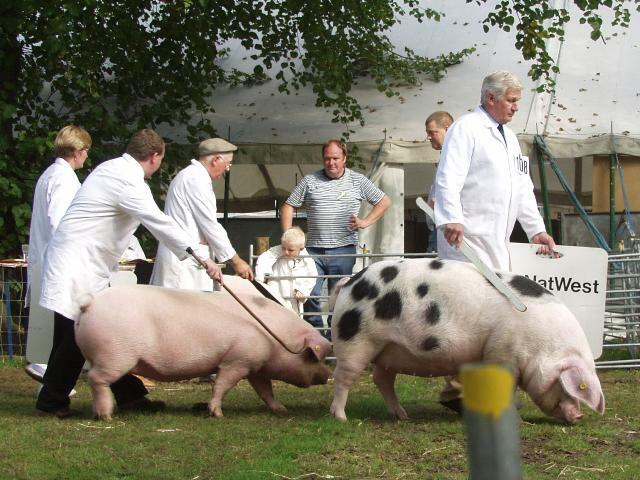 Showing is not all that daunting – unlike some other species, pig exhibitors will give you lots of help. Many shows are held around the country, and our Shows page will give you a list of shows that you might like to enter. 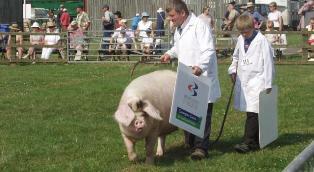 You can always come along and chat with exhibitors at shows to get a feel for what it is like to show. There are some helpful articles which give good advice to novice exhibitors. Sarah Whitley shows how it’s done. 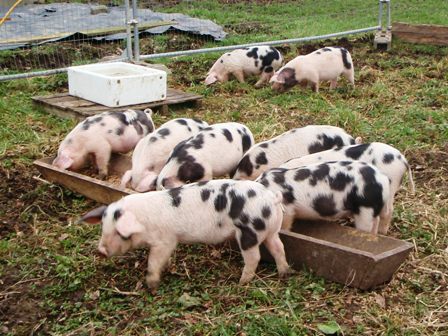 When you get into showing pigs, one thing you’ll need is wood flour. This is a fine floor used after the final wash to help dry the pig off and to ‘whiten’ the coat and skin (chalk etc. are banned). You can get supplies here – http://www.waldburgshires.co.uk. To make the black spots stand out and shine, rub in a little oil such as baby oil. Showing GOS pigs is a great advertisement for the breed and your herd – shows are the shop window which help sell pigs. Chillaxing at the South of England Show.